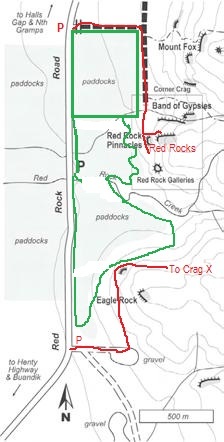 Following an alert by a NSW climber who had recently climbed in the area, we now know that the access details for the Red Rocks area is now changed. (Note: this ‘new’ access has always been available, but due to arrangements with the previous owner of the private property, access was allowed directly across the paddocks. Kieran Loughran has put together an outline and map of the new details and these are below. It is vitally important that climbers respect the wishes of the property owner. I will be making some further enquiries into the situation but as of this moment please abide by his request. Gypsies, Crag X, Far Pavilion). not cross the paddocks to get to the cliffs. depending on which is least inconvenient for the area being visited. This entry was posted in Grampians and tagged grampians, victoria range by Tracey. Bookmark the permalink.